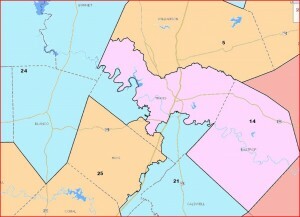 It’s official, the maps the Lege drew for itself and for Congress will not be used in the 2012 election. A Washington-based federal court on Tuesday rejected Texas’ request to approve new political districts without a trial. In a brief ruling, the court agreed with the U.S. Department of Justice that the GOP-led Legislature used an improper standard for determining whether the new districts discriminate against minorities. The order clears the way for a trial. The ruling means temporary maps, being crafted by a San Antonio court, will likely be implemented in the interim to allow election workers and candidates to make necessary arrangements for next year’s primary elections. 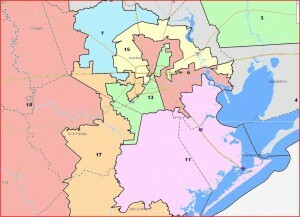 Having carefully considered the entire record and the parties’ arguments, the Court finds and concludes that the State of Texas used an improper standard or methodology to determine which districts afford minority voters the ability to elect their preferred candidates of choice and that there are material issues of fact in dispute that prevent this Court from entering declaratory judgment that the three redistricting plans meet the requirements of Section 5 of the Voting Rights Act. 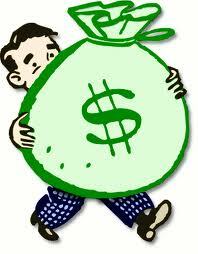 Remember, the state sued in the DC court because they’d get a better deal than the Justice Department. They also thought, or at least they believed AG Greg Abbott when he claimed they’d get a quicker resolution than the traditional route. Oops. The order applies to the Congressional, State Senate, and State House maps that were drawn by the Lege. The SBOE map did receive preclearance and is good to go. Expect to see an awful lot of campaign activity in the coming weeks, once people realize where they are and what the new districts really will look like. 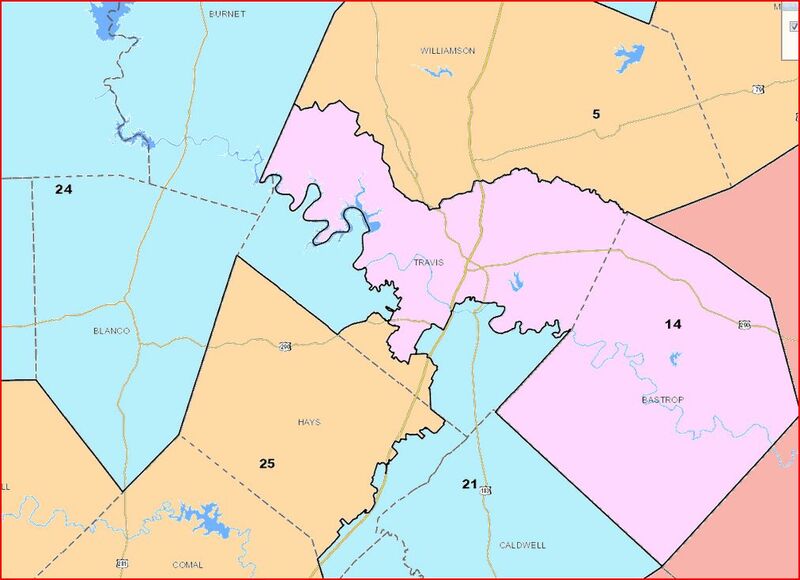 Among other things, the Senate map may well look a lot brighter for Sen. Wendy Davis, but it wouldn’t stop there. If you look at the population analysis, the Davis/LULAC map creates 13 Democratic Senate districts – the 12 existing ones plus a new one in Dallas County (SD09) that it achieves by pairing John Carona and Florence Shapiro, the latter of whom is retiring anyway. To say the least, if the San Antonio court adopts that plan, it’s quite a game changer. Postcards, PoliTex, the Trib, BOR, and Texas Redistricting have more. One more out the door of the upper chamber. State Sen. Chris Harris, R-Arlington, announced [Monday] afternoon that he will not seek reelection — the fourth veteran lawmaker to announce their retirement from the Upper Chamber. He is the longest serving Republican in the Senate and chairs the Senate Jurisprudence Committee. Harris has served in the Senate since 1991 and served before that in the Texas House. State Rep. Rodney Anderson, R-Grand Prairie, announced last month that he planned to challenge Harris in next year’s primary, insisting that the district needed a more conservative voice. Harris said at the time that he planned to run again. In his announcement, Harris encouraged Victor Vandergriff, son of late former Tarrant County Commissioner and Arlington Mayor Tom Vandergriff, to replace him in the Senate. Sen. Harris is joined at the exit by State Rep. Will Hartnett in HD114. Eleven-term Dallas state Rep. Will Hartnett has decided not to seek re-election, creating an opening for other Republicans to move up the ladder — or in one case, return to the House. As expected, Hartnett said in a statement on his future plans Thursday that he would retire. “My wife and three sons have stood by me during my years of public service, and now I look forward to having more time to stand by them in our family life and events that, in the end, are vastly more important than political life,” he said. A mixed record, to say the least, but I will definitely give him his props for running a fair election contest process. I hope whoever succeeds him at that does half as good a job at it. 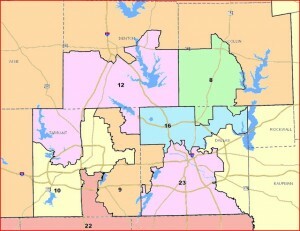 There was only so much the Republicans could do to hold onto what they won in 2010 in Dallas County. With HD114 being open, this ought to be a top tier race. As for SD09, as redrawn by the Lege it’s almost identical to SD10 in terms of partisan performance. Assuming SD10 doesn’t get altered by the courts, it deserves a respectable challenge from a Democratic contender. For what it’s worth, SD09 could have been a pickup for the Dems in 2008 – as it is now in the new map, SD09 was nearly identical to SD10 in partisan performance, when Sen. Wendy Davis knocked off Kim Brimer. Sen. Harris was fortunate to draw an underfunded no-name, and still barely beat him by ten points. 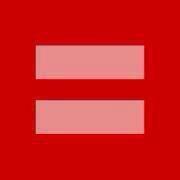 All ancient history now. I wish Sen. Harris and Rep. Hartnett well in their retirement, and I hope someone on the Democratic side is sizing both of these races up. 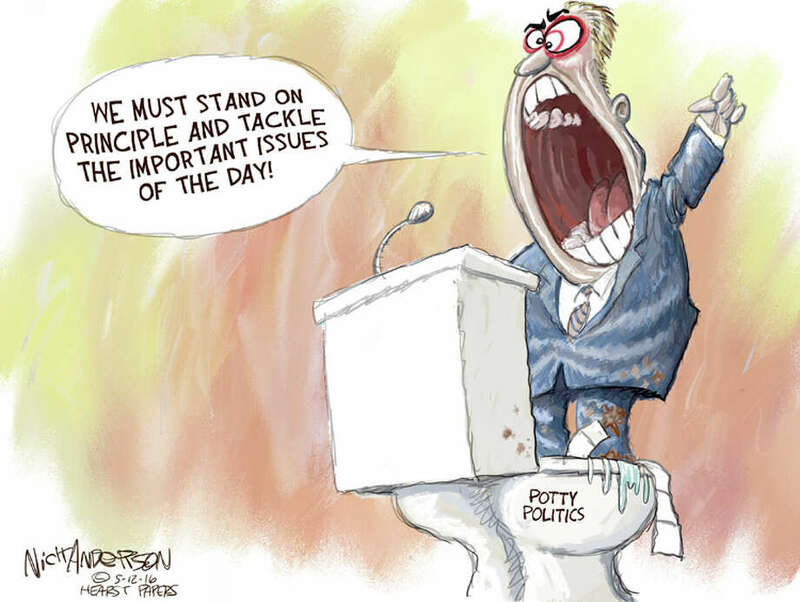 Some nice work by the Trib here. Our new interactive map visualizes population changes by district for the total population and residents who are of Hispanic origin. These totals are especially important now given that lawmakers are preparing to redraw these districts based on their growth, demographics and election histories. The data behind the map reveal some interesting trends. As we’ve seen, suburban areas around Texas’ largest cities saw the robust growth in the Hispanic population — both in raw totals and rate. That means suburban representatives — most of whom are Republicans — are seeing an influx of potential voters from a group that has traditionally favored Democrats. You can see the map here. As a companion to that, bookmark the Texas Legislative Council’s redistricting page, in particular the ones that show election returns by Senate and House districts. That serves nicely as a lead in to this Trib story about the challenges the mapmakers will face, and who’s in for a rough couple of months while they’re working it all out. In any conversation about who is vulnerable in the redistricting process, the four freshmen from West Texas always rise to the top of the list. Sure enough, when the census numbers came out, that part of Texas lagged behind the state’s overall growth; there aren’t enough people there to justify the number of state representatives in the Legislature. Two will have to go. It’s not at all clear this early who’ll be on the list, but two things stand out. State Rep. Warren Chisum, R-Pampa, is interested in running for the Texas Railroad Commission and won’t be back, so that seat will be easy to delete. And of the four Republican freshmen, Rep. Jim Landtroop of Plainview is the least well-anchored. Rep. Walter “Four” Price is based in Amarillo, and John Frullo and Charles Perry call Lubbock home. Only 22,194 people live in Plainview, and the 16-county district is spread out like a crucifix that reaches from north of Lubbock to south of Midland. Parties and friendships aside, it’s an easy district to cut up. 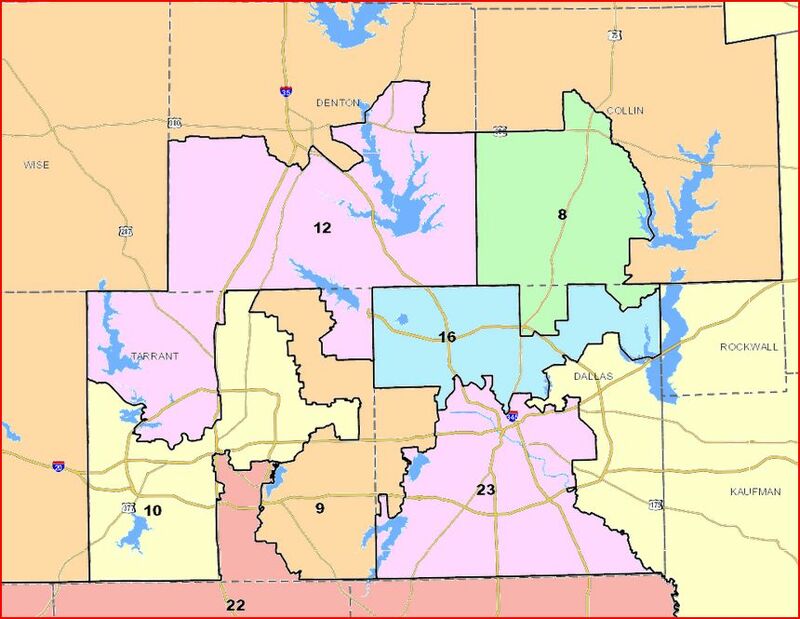 Or look at Tarrant County, where Sen. Wendy Davis, a Fort Worth Democrat, is completely surrounded by Republicans, two of whom need to add people to their districts. Her seat isn’t a district protected by the federal Voting Rights Act — it voted for Republican John McCain in the 2008 presidential election — and she’s a Democrat in a legislative body in which Republicans would gain solid control by flipping a couple of seats to their side. Like Landtroop, she’s got time to negotiate, and a district that will require her to be good at it. Or look at U.S. Rep. Blake Farenthold, R-Corpus Christi, a freshman who surprised Democrats and Republicans alike when he beat U.S. Rep. Solomon Ortiz, D-Corpus Christi, in the November elections. Texas gets four new U.S. congressional seats in 2012, and Latinos are pushing for at least one in South Texas. Farenthold’s district isn’t stable ground for a Republican and could easily be affected by changes in the lines nearby. And he’s a freshman at a time when it would be more useful to be an incumbent. Harris is between Davis and Democratic Sen. Royce West in SD23, with Sen. John Carona’s SD16 just touching his district to the northeast. Davis’ district actually has the most people in it of those four – she has 834,265, which by my count is the 12th-most populous Senate district overall; Harris has 807,907; West 749,622; Carona 641,007; his is the least populated Senate district, and was the only one to decrease in number. I’m not saying she has nothing to fear, just that as always with redistricting, you can’t look at any one district in isolation. What happens to her will affect everyone around her, and just as Travis County could not sustain three Republican House districts after 2002, it’s not at all clear to me that Dallas and Tarrant Counties can sustain having only one Democratic Senate district. Anyway. Maps! They’ve got ’em, we like ’em, go look at ’em and see what you think. Robert Miller has more.